What do you do when someone brings you back a bag of roasted macadamia nuts all the way from Hawaii? Well, I don’t know about you, but after staring at said bag sitting on the pantry shelf for over a month and trying to find the perfect recipe worthy of them…I finally break down and just make a batch of white chocolate macadamia nut cookies. Just make a batch of cookies…only these are some Ah-mazingly good cookies. I don’t think I could buy another pack of break and bakes after these babies. 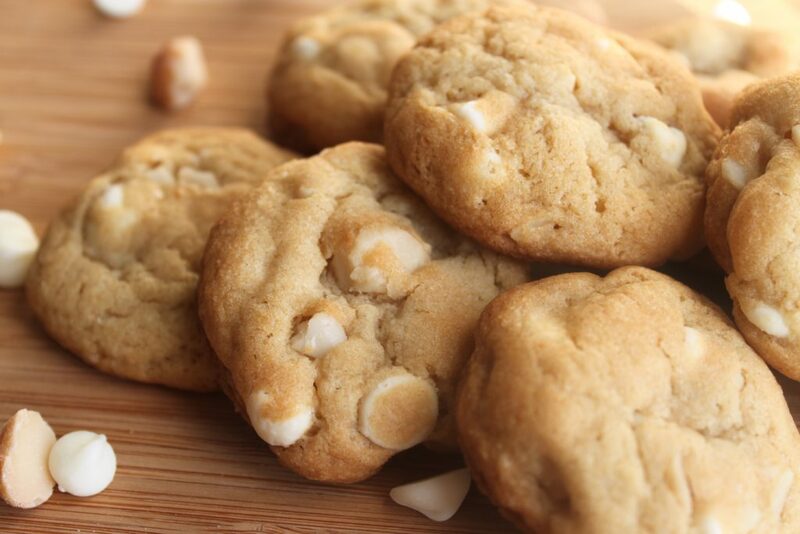 Do your sweet tooth a favor and whip up a batch of these white chocolate macadamia nut cookies. Cookies are the best medicine. Who’s with me? 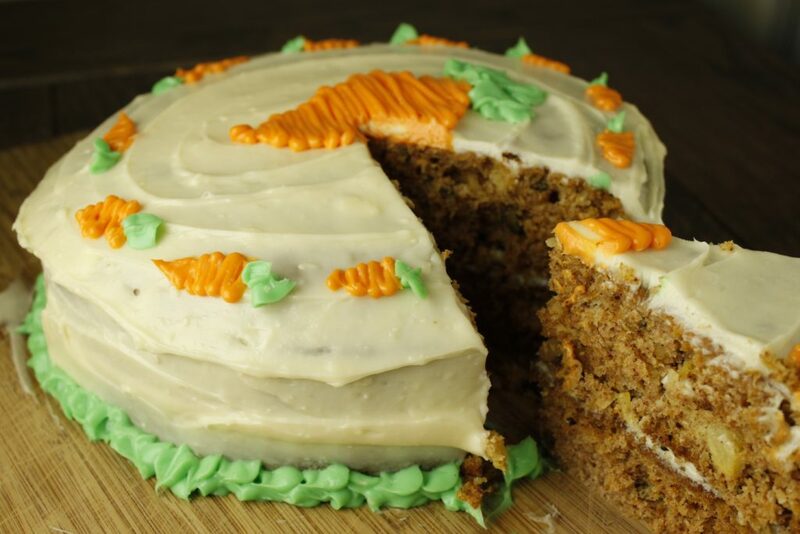 I’ll be the first to admit it, I’m not much of a carrot cake fan…but this classic carrot cake is seriously tasty! 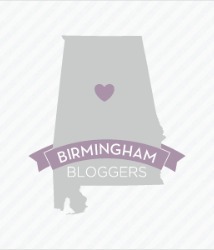 Warning: I’m going to use one of those dreaded words. Moist. This cake is so incredibly moist and perfectly spiced with simple ingredients that you likely have on hand already at home. 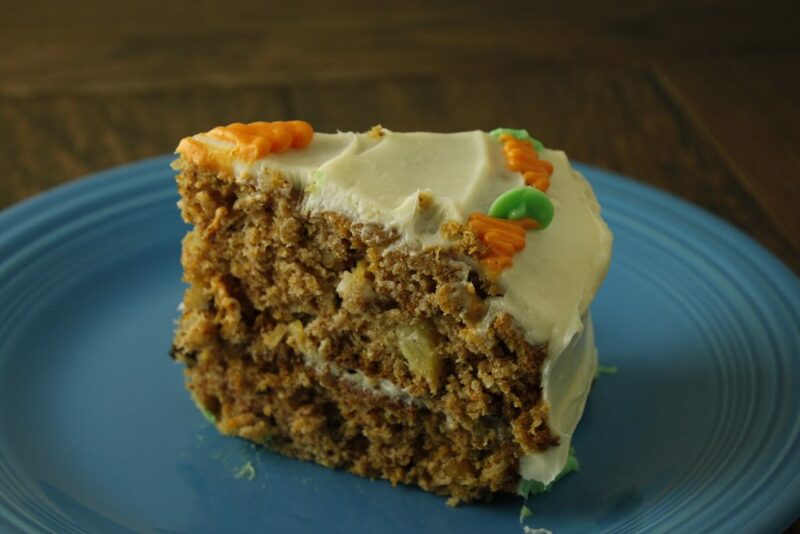 We agreed that this is the some of the best carrot cake we’ve ever had. Don’t you love it when something you make yourself reaches that best ever status? Such a good feeling. Anyway…this carrot cake is the perfect dessert to share with your family this Spring or to finish off your Easter dinner. 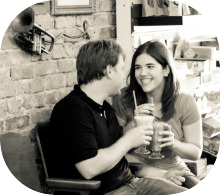 It is sure to be a hit with the whole family and is a sneaky way to get some veggies into those picky eaters’ bellies. I don’t know why, but I was really surprised when our moderately picky eater suddenly became an uber picky toddler who refuses to eat anything and everything. Even foods that he previously loved like mac n’ cheese, pizza, and chicken nuggets have been refused lately. These are kid classics! Needless to say, veggies have made the no-go list which has kicked off a desperate search for new recipes to sneak veggies into. I might have to try to adapt this recipe into a slightly less sugary carrot cake inspired muffin in the near future. If anyone has any favorite hidden veggie recipes, send them my way. 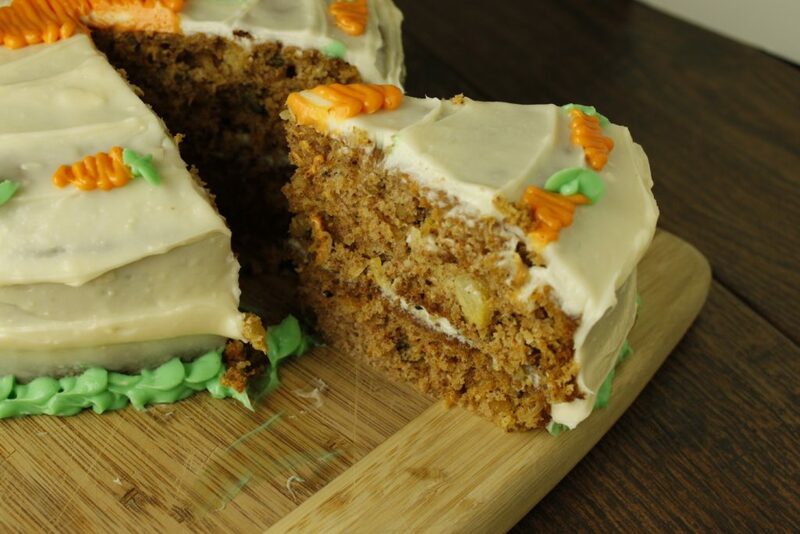 But before you do, make this awesome carrot cake! Preheat oven to 350 degrees F. Spray with non-stick cooking spray and flour cake pan(s). Mix in dry ingredients including flour, baking soda, baking powder, salt and cinnamon. Stir in carrots. Fold in pecans (optional). Pour into prepared pan(s). Bake in the preheated oven for 35 to 45 minutes, or until a toothpick inserted into the center of the cake comes out clean. Let cool in pan for 10 minutes, then turn out onto another surface to finish cooling before frosting. To Make Frosting: In a medium bowl, combine butter, cream cheese, confectioners’ sugar and 1 teaspoon vanilla. Beat until the mixture is smooth and creamy. What’s a girl to do with leftover melted almond bark and heart-shaped sprinkles? 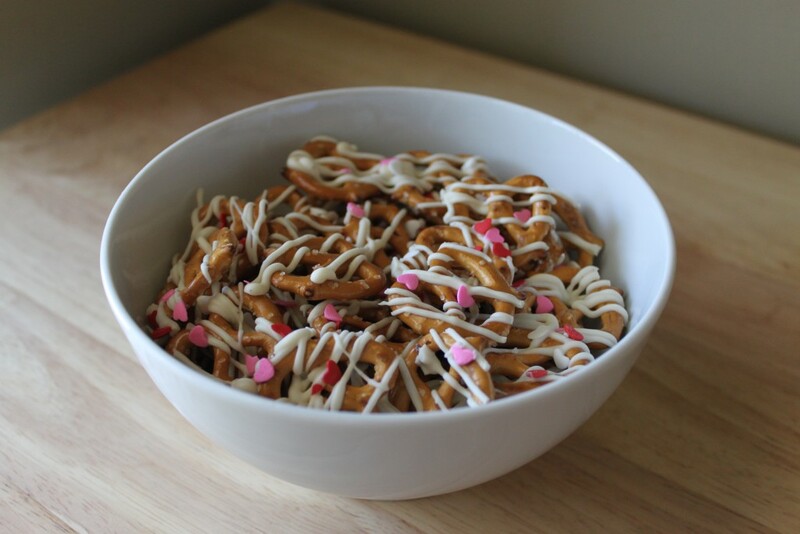 Make cutesy holiday themed “chocolate” covered pretzels of course. These were super simple to throw together, but oh so good to snack on. These pretzels disappeared in no time and were the perfect combo of sweet and salty to satisfy any craving. Lay wax paper on a baking sheet. Spread pretzels out flat on the wax paper. 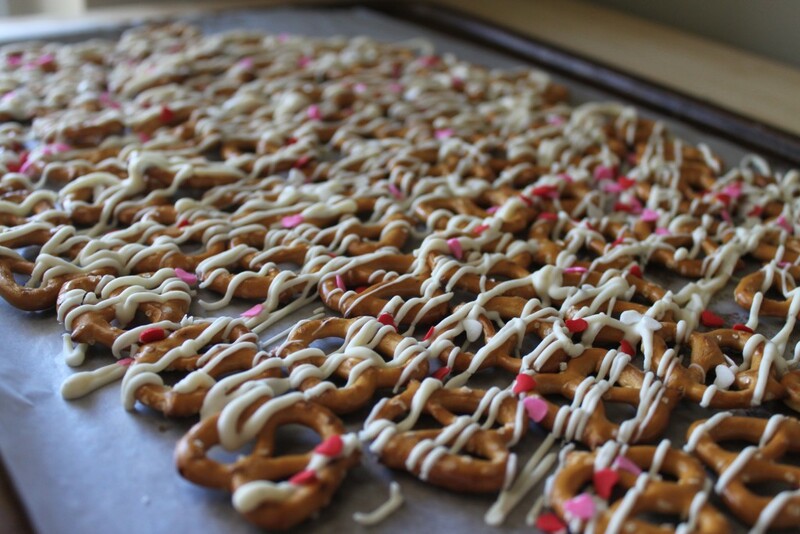 Drizzle pretzels back and forth with melted white almond bark or chocolate. Let sit until chocolate/bark hardens.